Enjoy the flavours of summer with this healthy vegetarian recipe for charred corn and farro salad. Loaded with cherry tomatoes, basil, and fresh corn. Charred corn and farro salad is one of the best things I’ve made all summer and I’ve made some pretty delicious salads and popsicles, so that’s saying something. 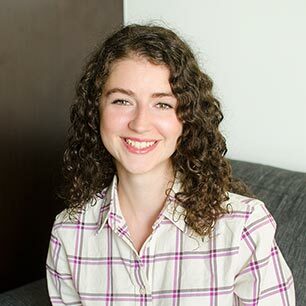 I think it might have something to do with all of the local produce that’s available right now – summer in Ontario is pretty fantastic, don’t even get me started on the peaches (I’ve got a delicious crumble coming your way this week). This farro salad is packed with local, sweet Ontario corn, and some fresh cherry tomatoes and basil from the garden. This dish is all of your summer favourites from Ontario combined in one salad. Did you know that corn is native to North America? It is thought that it was first cultivated in Mexico, which I think is pretty cool. Ever since I was a little girl, corn has always been one of my favourite foods. I have such vivid memories of my summers spent sitting on the deck of my grandmother’s cottage, biting into an ear of corn on the cob that was slathered with butter and salt. With every bite, the butter would drip down my arm. Just thinking about that makes me hungry. Even today, there is nothing like that first bite of local corn on the cob of the season, and it must be slathered with butter and salt. It is so sweet and juicy at this time of year, for this healthy salad recipe, I toss mine on the grill for a few minutes to get that delicious char that packs a ton of flavour. A little tip, when you’re buying corn, look for husks that are bright green and try to find ears with light yellow or brown silks that are slightly moist. Farro is a new love of mine. Have you ever tried it? It’s a fibre rich grain similar to spelt that is often found in Mediterranean cuisine (especially in Italy, Tuscan farro and bean soup anyone?). I think that it’s starting to really take off here in Canada, similar to what we saw with quinoa a couple of years ago. I’ve read that some think that farro is “the mother of all wheat” and is the original species of all other wheat species. 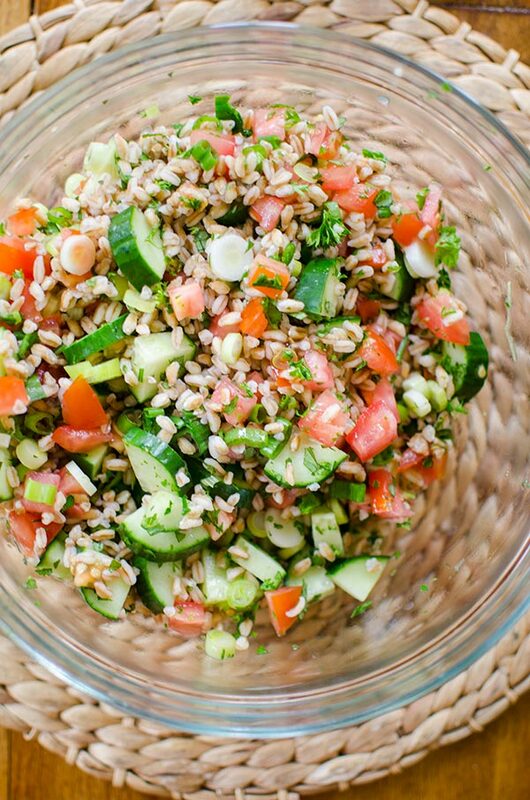 Try farro in my farro tabbouleh recipe. It’s nutty and slightly sweet and has a wonderful chewy texture that is perfect in soups and salads. I’ve paired it with some other Italian favourites, tomatoes and basil. Similar to quinoa, farro is high in protein and fibre making it a healthy option for a vegetarian main or a healthy and light lunch. I’m planning on doing lots more cooking and recipe development with farro over the next six months, lucky for us, it’s readily available in grocery stores (I’ve found it in three different grocery chains around Toronto). Toss corn on the barbecue to begin building flavour for this simple charred corn and farro salad. Loaded with cherry tomatoes, fresh basil and red onion this salad comes together with the help of a light vinaigrette. Cook 1 cup of farro according to package directions (I cook mine in vegetable broth). Meanwhile, preheat grill to medium-high, grill corn for 8-10 minutes, turning frequently to ensure even charring. 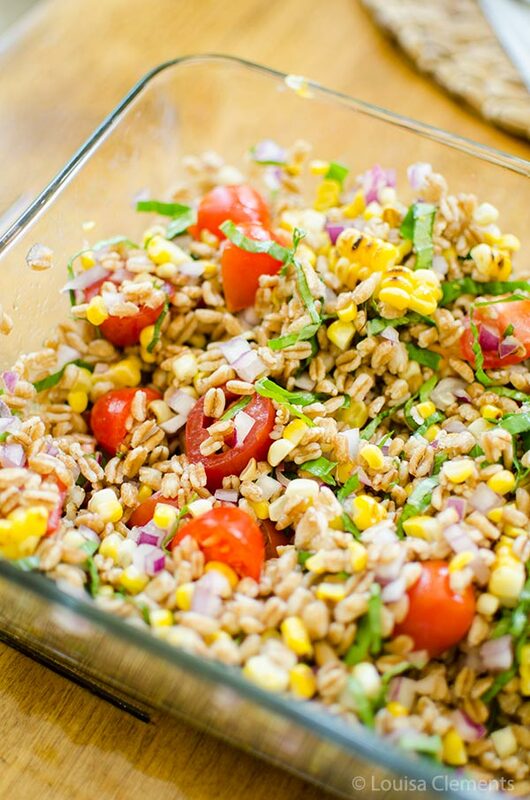 Slice kernels off cob and toss with farro cherry tomatoes, red onion, basil, olive oil, vinegar and salt. 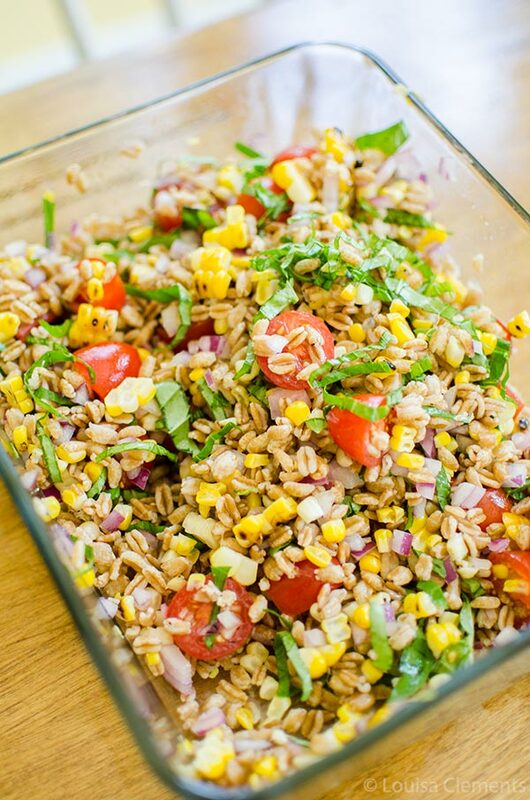 Enjoy this recipe for charred corn and farro salad, let me know if you give it a try.